Beth is studying veterinary medicine in Edinburgh, Scotland. She flew in from Scotland and started working on our farm the very next day. The temperature reached 101 degrees F, unusually hot for us, but it didn’t bother Beth. We followed the pigs’ example of staying in the shade, but we finished off our day with bowls of ice cream instead of mud baths. As a vet student who has completed rotations at farms across the US and the UK, I can confidently say that the high quality of animal health and welfare at California Kurobuta is exceptional. 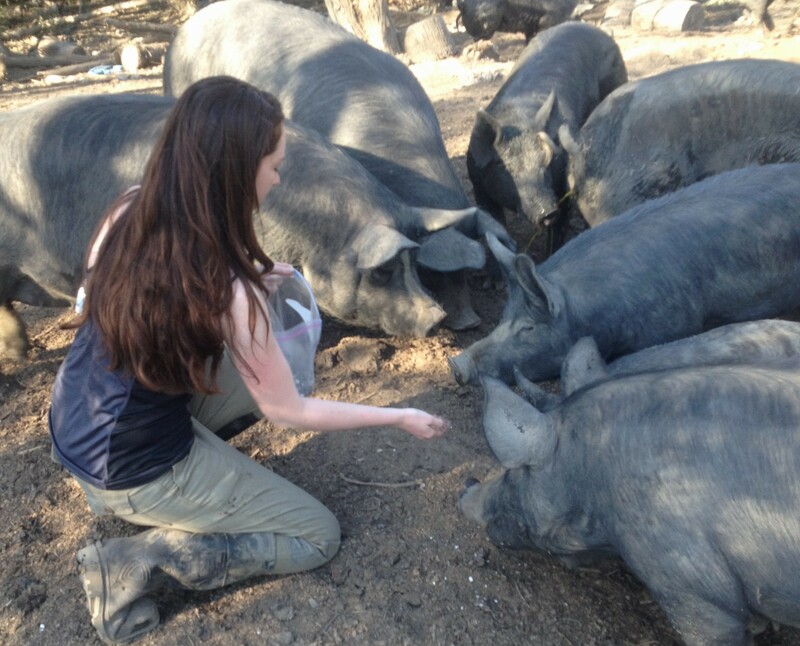 I spent a week amongst the most pampered pigs I have have ever encountered. They are free to roam extensive pastures shaded with trees and cooled with muddy ponds. Their life style is natural; ­ free of farrowing crates, unnatural confinement, antibiotic and hormone additives and many of the other health and welfare issues surrounding intensive commercial pig farming. Not surprisingly, happy healthy pigs create incredible pork. Their lifestyle is inevitably conducive to a superior product. The Berkshire breed is known for producing top notch table meat, rich in omega 3 fatty acids and incredibly flavorful. I highly recommend the leg roast. My time here was a refreshing and enlightening lesson in just how humane and health conscious livestock farming can and should be.